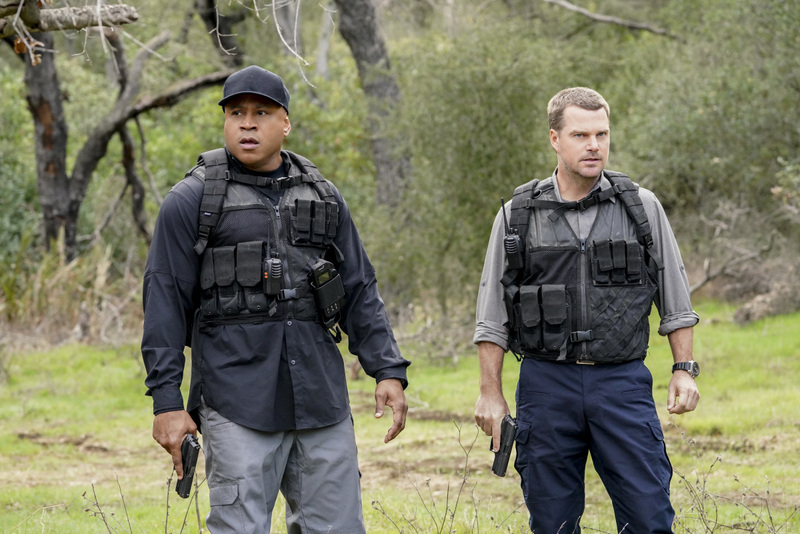 Preview images and guest cast list for the NCIS: Los Angeles episode "Reentry"
Callen, Sam and Nell travel to the Angeles Forest to search for pieces of a failed rocket launch, including a top-secret government device. Also, Hetty tries to help Keane (Jeff Kober) acclimate to life in the states, on NCIS: LOS ANGELES, Sunday, April 29 (9:00-10:00 PM, ET/PT) on the CBS Television Network. "Reentry" - Pictured: LL COOL J (Special Agent Sam Hanna) and Chris O'Donnell (Special Agent G. Callen). Callen, Sam and Nell travel to the Angeles Forest to search for pieces of a failed rocket launch, including a top-secret government device. Also, Hetty tries to help Keane (Jeff Kober) acclimate to life in the states, on NCIS: LOS ANGELES, Sunday, April 29 (9:00-10:00 PM, ET/PT) on the CBS Television Network. Photo: Bill Inoshita/CBS ÃÂ©2018 CBS Broadcasting, Inc. All Rights Reserved. Recurring cast appearing in “Reentry” includes Andrea Bordeaux as NCIS Special Agent Harley Hidoko. Additional guest stars include Jeff Kober (Harris Keane), Michael McMillian (Donald Jenkins), Ramon Fernandez (Franco Martinez), Josh Coxx (NRO Mission Director USAF Colonel Lawrence Lawson), Mary Hollis Inboden (NRO Chief of Staff Melissa Gates), June Schreiner (Vanessa Podrasky), Travis Caldwell (Dave), Marcelo Tubert (Sajad Khadem), KJ Smith (Chelsea Parker), John Churchill (Strike Team Leader), and Alain Washnevsky (Bodyguard #1).